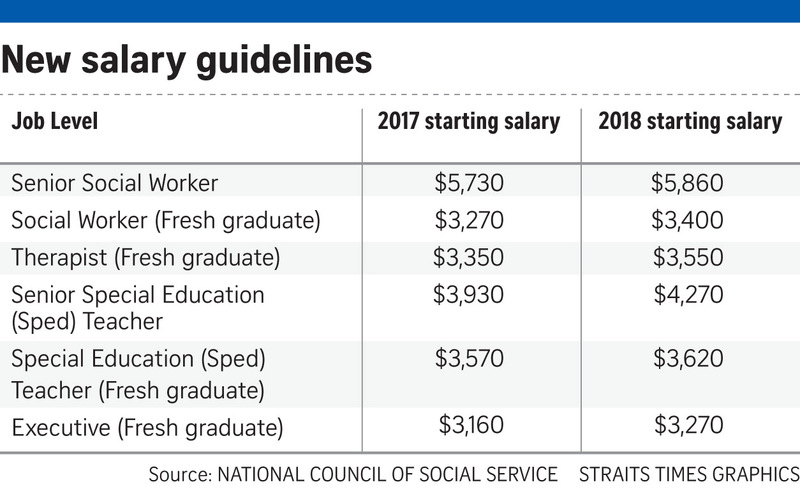 Staff in the social service sector can expect to see their wages increase again, following new pay guidelines posted on the National Council of Social Service's (NCSS) website last Thursday. The changes kicked in on Sunday. Social workers who are fresh out of university - including those with a degree in social work from the Singapore University of Social Sciences or a bachelor of social sciences with a major in social work from the National University of Singapore - will now earn $3,400 a month, up 4 per cent from $3,270. Those with a degree in physiotherapy or speech and language therapy can expect a starting salary of $3,550 a month, up 6 per cent from $3,350. As for special education teachers who work with children with disabilities, university graduates will command a starting salary of $3,620 a month, up from $3,570. These teachers also hold a diploma in special education from the National Institute of Education (NIE). The latest pay guidelines cover a host of workers in the sector, from social workers to therapists and executives, across varying levels of seniority. These staff are not hired by the Ministry of Social and Family Development (MSF) but by social service organisations, such as family service centres and children's homes, which run programmes funded by the ministry. The increments were first announced last month during the ministry's Budget debate, which said the salary guidelines for staff working in MSF-funded programmes would increase by up to 12 per cent from its last financial year, which ended in March. Minister for Social and Family Development Desmond Lee said in Parliament during the debate: "Many of those who work in the social service sector do not do it for the remuneration. They see it as a calling. Nonetheless, they deserve to receive a fair and competitive wage and have their contributions recognised." Although the MSF and the NCSS review salary guidelines every three years to ensure that wages remain competitive, pay guidelines are also adjusted in between reviews. This is to reflect wage movements in the general labour market. The last salary adjustment for workers in the sector took effect from April last year. While it is not compulsory to adhere to the pay guidelines, charities interviewed said that they follow them in order to attract and retain staff. "If not, people will hop to another organisation," said Mr Leng Chin Fai, executive director of Fei Yue Community Services. The sector had about 15,000 workers as at the end of last year, and will need about 1,000 more by next year. Social workers' salaries have risen considerably in recent years. The recommended starting pay for a social worker fresh out of university was $2,760 in 2012. 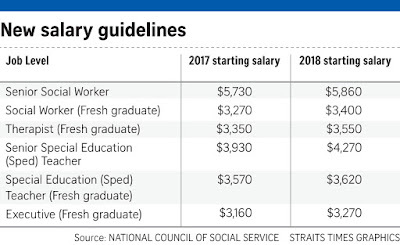 At $3,400 now, it is on a par with the starting salaries of teachers - which is between $3,100 and $3,500 a month for those with a post-graduate diploma in education from the NIE. Based on the joint graduate employment survey released in February, the median monthly salary was $3,400 last year for graduates of three universities here across a broad range of disciplines, such as business, engineering and law. However, the challenge for charities is to raise more donations to match the salary increases, as not all of their programmes are funded by the MSF, said Ms Adelyn Poh, co-founder of Care Singapore, a charity that helps vulnerable youth. And they cannot raise only the salaries of staff working in MSF-funded programmes and not others. But charities in the sector said donors are rarely keen to donate to fund salary increases.